Home > News > Cryptic? Whatever the case, the photos attached with this blog post were taken at the Conservancy’s flagship preserve today. 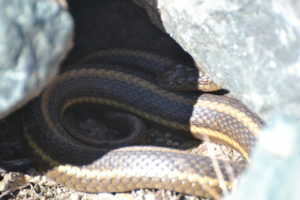 You can see the large, angular rocks that the snake is partially concealed in. We have found that Giant garter snakes love the hiding places provided by these rock pilings, which the Conservancy typically places adjacent to water so that this aquatic snake can easily move from aquatic to terrestrial environments while spending little energy. 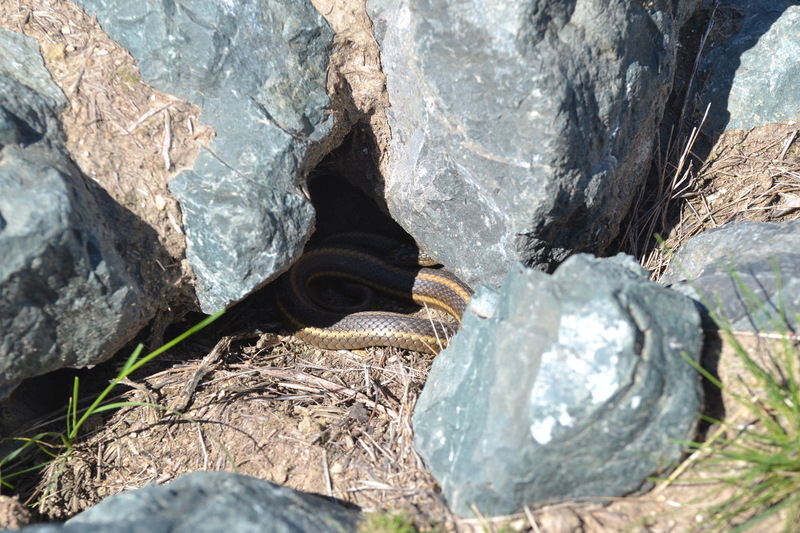 We believe the snakes also like the warmth provided by these rocks on a sunny day like today. But the main attribute is, we suspect, that there are lots of hiding places for this cryptic animal!